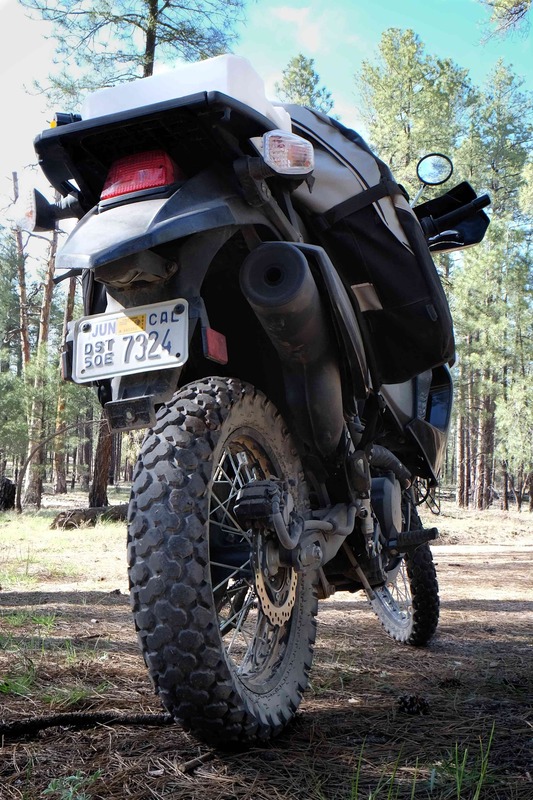 For the adventure rider, there are innumerable decisions to be made with regard to luggage selection. The most obvious is whether or not to go with hard cases or soft bags. While there are sound reasons for hard cases, many riders are best served with the latter. Aside from the fact most soft luggage systems cost a fraction of their hard-sided cousins, soft bags are invariably lighter, hug the motorcycle closer for better weight distribution, and perhaps the most important factor, feel a lot nicer when they come crashing down on your leg. Ask me how I know. 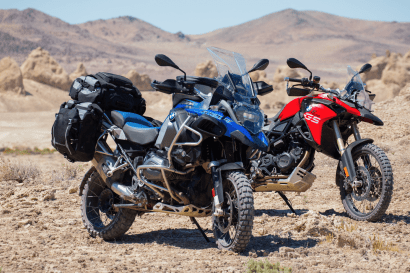 When it came time to outfit our Expedition Portal KLR project bike with luggage, we wanted to select a system which paired well with the bike’s intended use and better attributes. 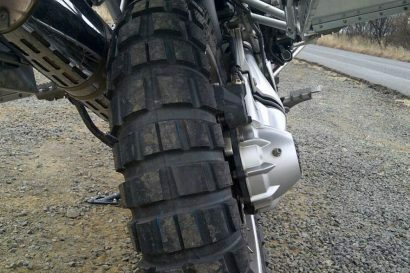 The KLR is actually a sound off-road performer, and as such we have every inclination to use it in that capacity. Soft bags just seemed like a logical choice, and Giant Loop has served us well on many an adventure. With a call to Giant Loop, we had two new bags on route, and in one fell swoop our luggage solution was complete. 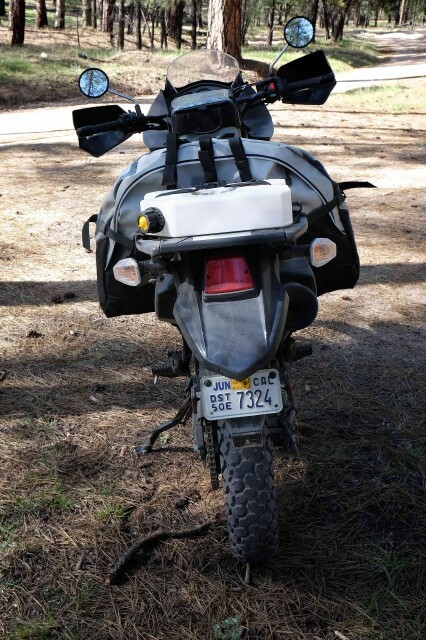 With our adventure ambitions set high for this bike, we opted for the largest saddlebag in the Giant Loop inventory, the Great Basin Saddlebag. The Great Basin offers 60 liters of storage capacity making it a formidable hauler. 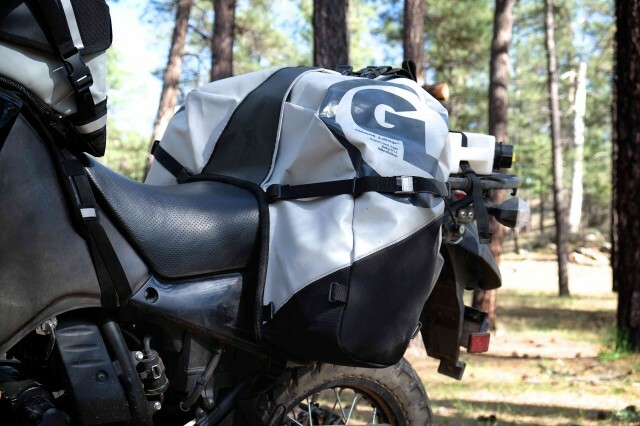 True to the brand’s name, the bag hugs the bike in one, well, giant loop. 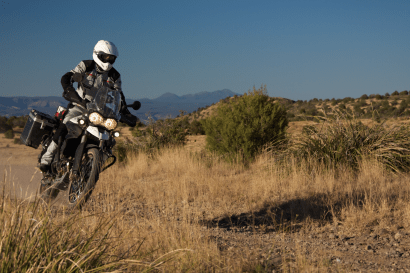 Wrapped tightly over the rear seat and strapped securely to the passenger pegs and rear rack, the Great Basin doesn’t so much as wiggle. This is not an attribute to be overlooked as many soft bag solutions flop and shift continually, even on mild terrain. Another nice feature of the Great Basin is the ability to be secured to the bike via an optional cable and lock. Accessing the contents of the Great Basin is achieved with a full-length #10 YKK zipper along the back side of the bag. That aperture opens wide enough to swallow the provided dry bags which are designed to fit the unique shape of the lower portion of the main bag for optimal packing efficiency. The interior of the bag is lined with bright yellow nylon which keeps the bag from being a black hole. Securing everything and reducing the load on the zipper are a trio of straps across the top of the bag. Those straps can be used to lash additional bags to the Great Basin making for a solid and simple anchoring point. Additional compression straps are positioned on either side of the bag, the lower aspects of each side covered in ultra-durable Cordura fabric. These are stoutly built products and their durability has been tested around the globe. Space between the two bags is admittedly tight in this picture, but moving the Great Basin Bag further back is easily achieved. The inner dry bags guarantee dry contents, but having used other Giant Loop bags in torrential downpours, the main bags are surprisingly weather resistant. 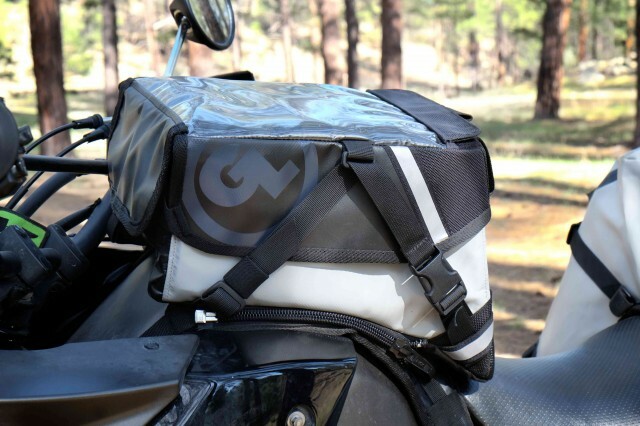 One of the first things we affix to any bike, a tank bag is were we store all of those things we need close at hand. For us, that typically means a full-size DSLR camera. Plopping $4,000 worth of delicate camera gear on top of a gas tank isn’t done without some forethought and a great deal of trust in the bag used. 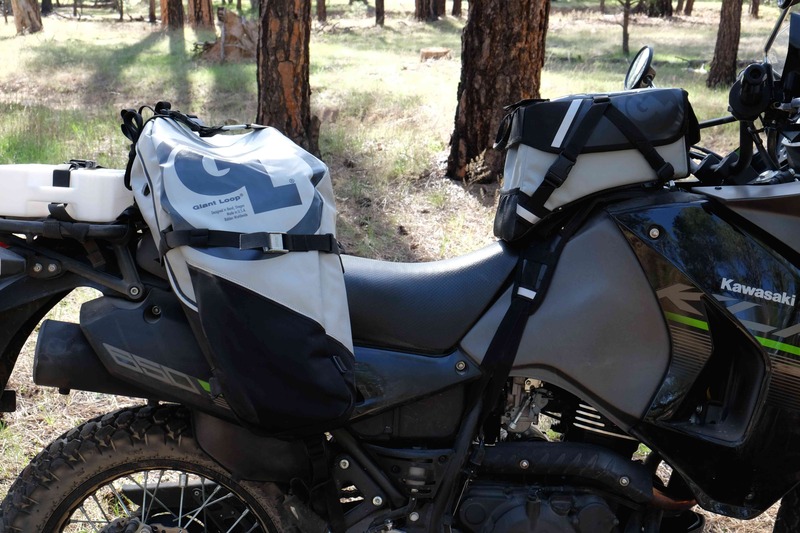 We’ve carried cameras in Giant Loop bags for thousands of miles and the new Kiger Tank Bag is destined to serve that purpose for thousands of miles to come. The larger brother to the popular Giant Loop Fandango bag, the new Kiger introduces new features never before employed by Giant Loop, or any manufacturer that we know of. The 9 liters of storage provided by the Kiger make it sufficiently capable for carrying far more than just camera gear. The large clear plastic lid is big enough to hold a full sized tablet and retains the ability to use the touch screen features for easy use of navigational apps. That lid is opened quickly and easily with the release of two side buckles. Once inside the main bag, a removable inner dry bag can be used to protect your delicate contents. 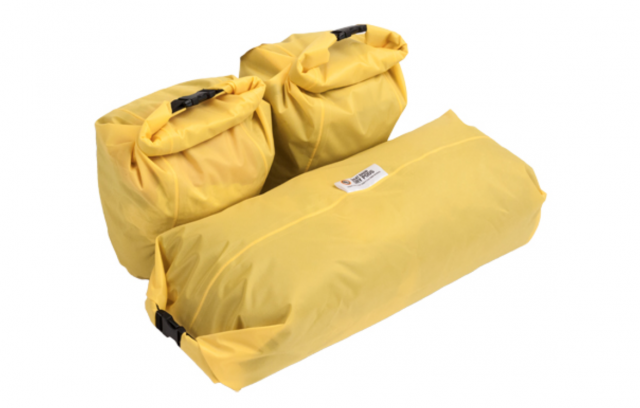 The bright yellow inner dry bag has a waterproof zipper and two buckles to further secure the contents. One of the more unique features of the Kiger is the adjustable, clamshell lid which is held in place with strong hook and loop fasteners. This unique system allows the lid to float above the main bag for some adjustment to the storage volume, and allows for an easy pass-through for charging cords. 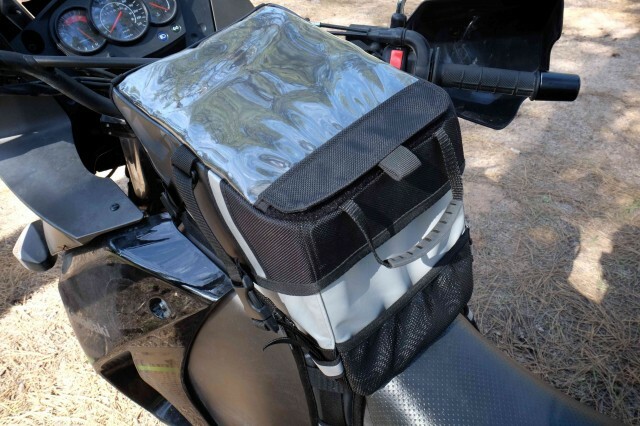 One of the features we have always liked about Giant Loop tank bags is the well designed harness system used to secure the bag to the bike. Once the harness is secured, the tank bag zips in place with two large gauge zippers. Those zippers run a straight course with no curves to contend with. To access the fuel cap, simply unzip one side of the tank bag harness and the fuel cap is easily exposed. Once removed from the bike, a large grab handle makes for an comfortable carry. 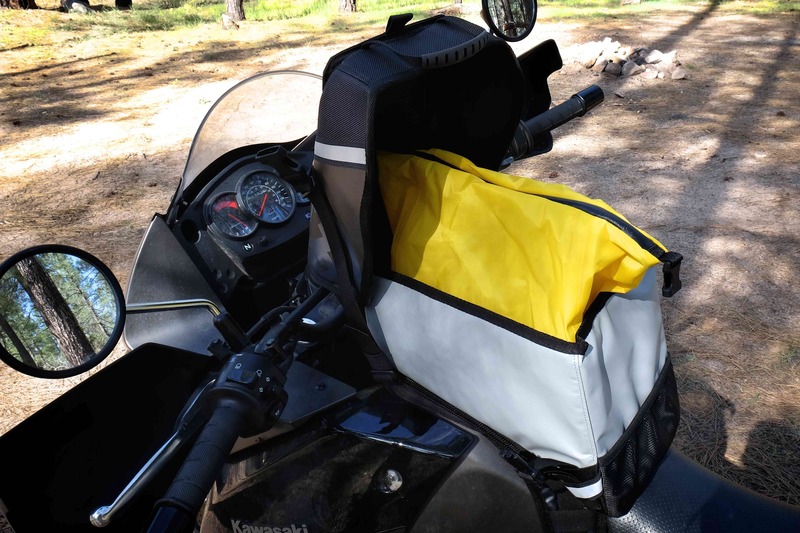 Other nice refinements include a small mesh inner pocket and a large mesh pocket on the exterior of the bag facing the rider. Between the Great Basin and Kiger bags we may not require any additional storage solutions, but there are others from Giant Loop we could consider. 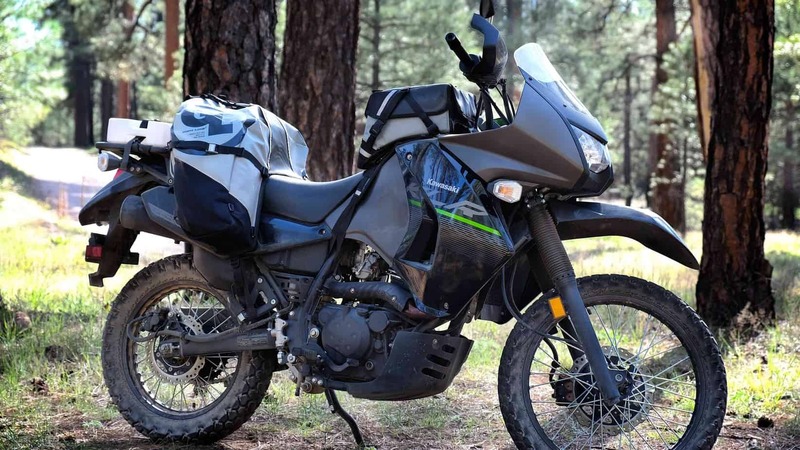 Their Rogue Dry Bag is a perfect compliment to the Great Basin and would perch on the rear rack perfectly. As spring transitions to summer, we look forward to more time with these bags. So far, they’ve exceeded expectations.